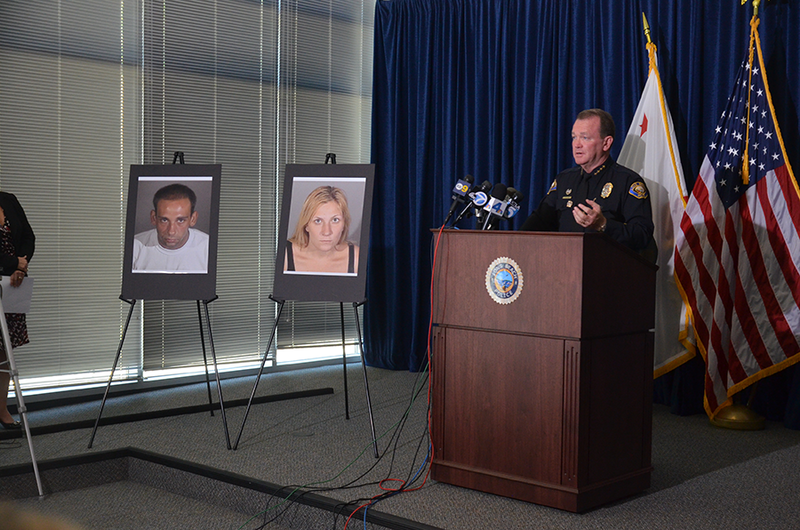 Long Beach Police Chief Jim McDonnell standing next to photos of Gus Adams and Andrea Miller. Photo by Brittany Woolsey. July 29, 4:27PM | According to the Long Beach Police Department, Gus Adams and Andrea Miller, two of the three suspects in the July 24 robbery in Bixby Knolls, had been previously arrested earlier this year on charges of elder abuse. On May 14 at approximately 8:25PM, Miller and Adams were both arrested at the home of an elderly male victim, located on the 2100 block of Maine Avenue after patrol officers conducted an investigation relating to the victim being extorted out of several hundred dollars. Miller and Adams were arrested and booked for a variety of charges that included extortion, embezzlement, and receiving funds under false pretenses, police say. Miller was killed on July 24 when Tom Greer, the Bixby Knolls resident whose home Miller and Adams were burglarizing, came home and discovered the pair in his house. Greer told police the suspects attacked him and jumped on him then fled. He then grabbed his .22-caliber Smith and Wesson revolver, chased Miller and Adams out of his home, and fired on the suspects. Miller was hit and later pronounced dead on the scene. July 29, 10:30AM | A Long Beach woman found to be a third suspect in connection with a robbery last week—which left one other female suspect dead after she was shot by the homeowner—was charged Monday with burglary and robbery. Prosecutors found Ruby Adams, 49, acted as a lookout during the July 22 burglary at the home of 80-year-old Bixby Knolls resident Tom Greer. Ruby Adams is the mother of Gus Adams, another suspect in the case, who is already in custody and has been charged with one count each of murder, residential robbery, residential burglary, grand theft of a firearm and felon possession of a firearm. Ruby Adams was charged with one count each of first-degree residential burglary and first-degree robbery, along with an allegation of elder abuse. Prosecutors plan to ask for bail of $175,000 for Adams, who was arrested Friday. She faces up to seven years in prison if she’s convicted. July 25, 6:02PM | Police have arrested a third suspect involved in Tuesday night’s robbery that left one other suspect dead after the resident fatally shot her. After investigating the incident further, Long Beach Police Department detectives discovered a third suspect, identified as 49-year-old Ruby Adams of Long Beach, was involved in the residential robbery. Adams was arrested and booked for robbery Thursday night. It is anticipated that charges will also be filed against Ruby Adams on Monday. Adams has been identified as the mother of another suspect, Gus Adams, who was arrested Wednesday and charged with one count each of murder, residential robbery, residential burglary, grand theft of a firearm and felon possession of a firearm. Police said the case pertaining to 80-year-old Tom Greer is under review by the District Attorney’s Office. Greer fatally shot Andrea Miller, one of the intruders, outside his Bixby Knolls home after he discovered the suspects had broken into his home. Greer has been quoted as saying that 28-year-old Miller, a Long Beach resident, claimed she pregnant before she was killed and used that as a plea while Greer was chasing her down an alleyway with a gun. The LA County Department of Coroner determined Friday that Miller was not pregnant. During the review process, police said it is uncommon for the DA’s Office to request additional investigative follow-up. July 25, 2:40PM | Ed Winter of the Los Angeles County Coroner’s Office has confirmed that Andrea Miller, the woman fatally shot by Long Beach resident Tom Greer after intruding into his home, was not pregnant at the time of her death. According to the 80-year-old Greer, Miller had claimed she was pregnant and to not shoot her at the time of the incident. July 24, 5:30PM | A Long Beach man is in custody in connection with a residential burglary Tuesday night, where one additional suspect was fatally shot by the resident. Long Beach Police Department Chief Jim McDonnell said at a press conference Thursday afternoon that 26-year-old Gus Adams of Long Beach was arrested Wednesday night for breaking into an elderly man’s Bixby Knolls home. An additional suspect, 28-year-old Andrea Miller of Long Beach, was shot and killed by the resident after he returned home to find his home being broken into. McDonnell said Greer told police the suspects attacked him and jumped on him then fled. He then grabbed his .22-caliber Smith and Wesson revolver, which he used to shoot at the suspects. Both suspects had a prior similar criminal history, McDonnell said, adding that he did not know if they were under probation or had any warrants. He also said they did not have any relationship to Greer and he didn’t know their relationship to each other. The resident, 80-year-old Tom Greer, told NBC4 that he shot Miller outside his home after she attacked him. McDonnell said Greer fired rounds inside his home before chasing the unarmed suspects into a nearby alley, where he shot Miller, who claimed she was pregnant while she was being chased. “She says, ‘Don’t shoot me, I’m pregnant! I’m going to have a baby!’ And I shot her anyway,” Greer said to NBC4. McDonnell said the Los Angeles County Coroner’s Office was working to determine if Miller was pregnant at the time she was killed, but said she showed no obvious signs of pregnancy during the incident. Greer was interviewed by police after the incident, and the Los Angeles District Attorney’s Office will decide if he will be charged with Miller’s death, McDonnell said. It is unknown how many shots were fired. McDonnell said the District Attorney’s Office will determine if Greer should be charged based on his state of mind during the incident. He also said Greer suffered a broken collar bone, cuts and bruises. If charged, there may be additional charges if Miller was pregnant, McDonnell said. Greer told police that his home had been broken into three times prior, two reported and one unreported, and he believed Miller and Adams were connected to those robberies also. Because the shooting occurred outside the home, the legalities of the shooting are uncertain, McDonnell said. He also said it was not yet known if the guns were registered in Greer’s name. Adams is being held on $1 million bail for residential robbery and murder, since he was involved in the events that led up to Miller’s death, McDonnell said.